Already up and running the tour is on its way to making history in Native country. Last years “Motivation On The Rezervation” tour made its way to over 120 Native communities across the Continental US and reached well over 100,000 Native peoples… and we are just getting started! This year we have implemented several new programs that not only inspire and motivate, but also challenge our youth to take action and become leaders. As many of you know Hip-Hop music has been looked upon with skepticism, not only in Native communities but abroad. Truth be told, many people often ignore the positive messages of hip-hop and only focus on the negative. Fact: In the last 10 years hip-hop has cut across ethnic boundaries and now studies show that music with positive message is a very effective tool in educating our youth. We here at RezHeadz have found a way to tap into the core of the subculture and educate to a new tune! Featuring Motivational Speaker and Recording Artist “Smoke” who is credited as the 1st Native American Hip Hop artist to ever have a record (My Dubz feat.Trae) reach the Top 10 charts in multiple music markets internationally! The 2010 Rezolution Tour will be coming to a Rez near you! Dates are still available but are going fast! What’s your New Years Rezolution? E DUBZ is a native rapper from maine, his lyrics are straight fire with strong messages behind his music, everybody support him and his efforts to make music not only 4 native people but for tha whole world!!! Hailing from East Vancouver, Manik1derful, DJ Sichuan and Magic Touch are the Starmakerz. 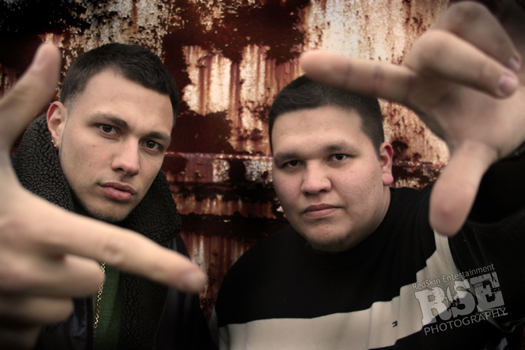 The award winning production team has helped Inez sweep the 2009 Aboriginal Peoples Choice Music Awards in Winnipeg, MB. As a group they’ve travelled all over, spreading their message and helping others along the way to become stars. Who are the Starmakerz and their affliations? How long has your team been together and how did you guys hook up? We have been making music for the last few years as the Starmakerz. Manik and Sichuan have been a team since the Sunday Skool Dropoutz but a few years ago we drafted the rookie of the year Magic Touch. We will make you a beat. Write you a song. Record it for you and get it released for you if need be. Basically if you have talent we will magnify it for the public to see! We notice alot of ya’ll that record music are working with average producers and mediocre engineers. We will be the difference! Who are some of the stars your team has worked with? Another crazy production from Six Nation’s own, 2oolman. More from 2oolman & Scorsese. News: BOOK The What’s Really Rez Tour! The What’s Really Rez Tour is here!!!! you love the Youtube hit Music Video? then your gonna love this! bring the What’s Really Rez Tour to your Community, Festival, Confrence, Night Club, Where ever! DATES WILL FILL UP FAST SO BOOK EARLY! Download the Poster at http://www.redpowersquad.net bring it to your peeps, community, promoters, club owners, basicaly who is in charge…lol then get the ball rolling to secure your date! many prizes, dvd’s, cd’s and all that good stuff to give away! so get on it CUZZINS!!!! Posted on January 11, 2010 June 24, 2014 Categories Promotions, VideoTags Red Power Squad, whats really rez tourLeave a comment on News: BOOK The What’s Really Rez Tour! THIS IS THE FREEDOWNLOAD TO SHOW YA’LL LOVE FOR THE LOVE YOU SHOW ME. Fresh from his win in Hamilton, Shawn Bernard aka Feenix stops by the studio to talk about his win for Best Hip Hop Video for the Canadian Aboriginal Music Awards. We also got a link on Joey Stylez lastest release, the Blackstar and we also got our hands on Tru Rez latest cd, Tru 2 Da Rez. Also new audio from Charlie Fettah, Drezus, Royal T & the Dirty Sample and K-Riz latest mixtape, Faithful 2 The Game.